I have just returned home after delivering my new entry an artwork into this year’s “On, Under and By the Sea” Postcards Exhibition at the Bay, Glenelg, which will be held during the Adelaide Fringe in the 175th anniversary year since European settlement in South Australia. The title to this art blog should have been “A day from Hell” but I will get to that in a minute. 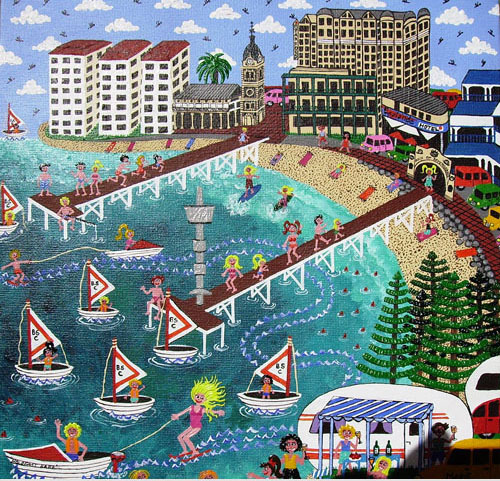 The above painting “From Kingston Park to Glenelg” was my entry in the last Postcard exhibition for 2009. A lady by the name of Victoria Rolinski won first prize and I plus 4 other artists won equal second prize and therefore had our artwork made into Postcards which from all accounts has been selling well at the Bay. At the time when I was asked to submit an artwork for this competition we still lived at the farm but had already bought the new house by the sea so my mind was full of sea inspired images, so it didn’t take me long to figure out what I wanted to paint. The inspiration for the above painting was really the balcony view from my cousin Dan and his partner Johnny’s house at Marino, although I do plead a bit of artistic license of course. You may want to read more about them, and their view and here is the link to the art blog 35. “THE FIRST ADAM & STEVE”. That all said and done, let me tell you about the “Day from Hell” when I delivered the new artwork; Firstly I was running late surprise, surprise, and while I raced off to the neighbors house my husband was warming up the car (or so I thought) I raced back and found the car had a flat battery and hubby is kindly transferring all my stuff to his car, setting up the GPS etc. So off I go, buy myself a can of vanish and proceed to spray the artwork in the car park, talk about last minute, lol. Most of the rest of the day was spent very pleasantly with darling daughter Hillivi, lunching, chatting, shopping and errands. Apart from what I thought was going to be incident number 4! Dropped Hillivi at the dentist and got into the lift on the 5th floor, pressed the button, door shut and nothing happened, me and the male occupant looked at each other and pressed the button again when the lift did a quick jolt and then slowly kicked into gear again. The man said “God I thought we were stuck or about to plummet to our deaths” and when I told him about my day so far, he said it was nice to meet me but if he knew earlier about my day he would not have got in the same lift, lol. Ps Keep your fingers crossed for me!